How does a British government respond when an allied state invades another territory with the backing of jihadists, overthrows a democratic experiment and consolidates an occupation? Judging by what Turkey is doing in the Afrin district of northern Syria, the answer is: by supporting it. Britain, far from helping to defeat terrorism in Syria, is once again aiding it. Turkey’s military intervention in Afrin was launched on 20 January and largely concluded on 18 March, when President Recep Tayyip Erdogan announced that his forces were in control of Afrin city. In that two-month period, over 200,000 people fled, and human rights groups accused Turkish forces of shelling civilians, killing scores, and indiscriminately shooting at refugees attempting to cross into Turkey. Turkey’s wrath was launched against the Kurdish People’s Protection Units (YPG), the dominant element in the Syrian Democratic Forces (SDF) fighting the Islamic State (IS) in northern Syria – but which Erdogan calls a “terror army” linked to the Kurdistan Workers’ Party (PKK) militant group in Turkey. Ankara has wanted to stop the US plan to stay in Syria and form a 30,000-strong force with the SDF to protect Syrian territory held by its mainly Kurdish allies. Turkey’s war aim appears to be to create a sphere of influence in northern Syria free from the Kurds. Britain has backed the intervention in Afrin, saying it recognises “Turkey’s legitimate interest in the security of its borders” – an apologia for Turkish actions that prompted a senior Turkish official to say that Ankara “appreciates” the UK stance. While London did go through the motions of calling for “de-escalation”, it rejected a call for a ceasefire. Throughout the military operation in Afrin, the UK was in “close communication” with Turkey and said it “cannot categorically state” that British weapons were not used. Last year, the UK already signalled it would do nothing to prevent a Turkish attack on Afrin. Britain has also helped Turkey out diplomatically by its ambassador to Ankara, Sir Dominick Chilcot, who has said the UK has “a lot of respect and consideration” for Turkey’s views on the YPG, and referred to the “potential threat posed by the YPG” and said it had “very close links” to the PKK. British support for Turkey is especially noteworthy in light of UK military support to the force it is fighting, the SDF. Although the UK is not known to have supplied arms to the YPG, unlike the US, the UK has carried out airstrikes to support the SDF that are “likely to have assisted the YPG”, a British parliamentary committee concluded. Moreover, in March, a British Special Air Service (SAS) soldier embedded with US forces was killed fighting with local Kurdish troops to stabilise the northern city of Manbij. SAS sources revealed that those who planted the bomb could belong to the Free Syrian Army (FSA), the same affiliation of militias, including jihadists, being backed by Turkey to take over Afrin. 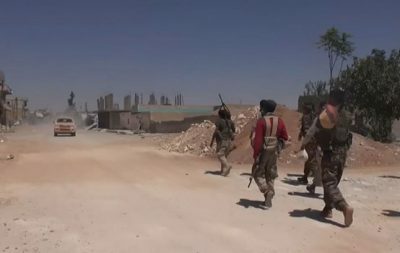 Journalist Patrick Cockburn reported that Turkey also recruited and trained ex-IS fighters to drive the YPG out of Afrin: Of the 10,000 FSA forces who crossed into Syria on 20 January with 6,000 Turkish troops, “most” were ex-IS and many were “open about their allegiance to al-Qaeda and its offshoots”. It can be presumed that Britain knows all about Turkish collaboration with jihadists. Turkey’s foreign minister, Mevlut Cavusoglu, has, for example, said that Turkey cooperates best with the US and UK in terms of intelligence-sharing on foreign fighters who want to use Turkish territories when entering or exiting Syria. As Britain arms Turkey, there is a real risk that such military equipment can end up in the hands of jihadists. Yet the British government defines Turkey as a priority market for promoting arms sales that have been worth more than £200 million ($265m) since 2016, including aircraft, helicopters, drones, grenades, small arms and ammunition. In January 2017, British Prime Minister Theresa May visited Ankara and signed a £100m deal to sell British warplanes to Turkey. Earlier this year, Turkish fighter jets of unknown origin reportedly bombed the main hospital in Afrin as part of the Turkish offensive, killing 16 people. Two months after the conquest of Afrin was completed, May welcomed Erdogan to London, where he also met the Queen. In a government statement, May said Ankara was an ally in the fight against terrorism, failed to mention Afrin at all, and only mentioned Kurds in the context of “Kurdish terrorism”. In a phone call with Erdogan last month, May said the UK would “continue working in partnership” with Turkey in Syria, showing that London is intensely relaxed about its ally’s collaboration with the jihadists it is meant to oppose. Once again, it can be seen that the UK’s principal aim in this part of the Middle East is not to fight terrorism, but to maintain its alliance with Turkey, sell arms and counter the Assad regime in Syria. This strategy has led it to undermine its main ally in the region fighting IS – the Kurdish Democratic Union Party (PYD) and its armed wing, the YPG, which the Foreign Office recognises “make an important contribution to counter-[IS] efforts”. Although the UK proscribes the PKK in Turkey as a terrorist organisation, it does not so regard the YPG in Syria; the minister of state for the Middle East, Alistair Burt, has said they are “separate organisations”. The PYD declared a self-governed territory that it refers to as Rojava, or the Democratic Federation of Northern Syria. Rojava showed a significant commitment to promoting multi-ethnic governance and women’s rights, having held elections in September last year. This experiment was demolished by Turkey’s takeover of Afrin, with Turkish forces taking over homes and seizing farms, while 134,000 Afrin residents remain displaced and face restrictions in returning. To students of British history, Britain’s favouring of Islamist-backed military conquest over more liberal, democratic forces comes as no surprise – rather, it is a leitmotif of British foreign policy in the Middle East. This article was originally published on Middle East Eye.